We had heard rumors of PTCL doubling broadband speeds for its DSL subscribers in March 2010. We were then told that PTCL may celebrate March 23rd, 2010 by doubling DSL speeds – however, plan got delayed due to capacity limitations then. Lately, we have received reports from multiple ProPakistani readers that they are experiencing double speeds on their PTCL DSL connections. We couldn’t arrange official viewpoint on this, however, confirmations from certain PTCL users are already available. Based on sources’ information, we can predict that this doubling of speed will be carried out in phases, while doubling process is said to be completed till August 14th, 2010. Update: At least one PTCL broadband subscriber has communicated us that his speed was doubled but it got back to its original speed of 1 MB with-in 2/3 days. As there is no official confirmation with us as of now, so we can’t confidently say that this upgrade is temporary or it gonna persist for all subscribers. Update 2: PTCL exchange staff from different regions has confirmed ProPakistani that up-gradation process has started. All bandwidths will be doubled in near future, upto 8 MB due to line limitations. PTCL will offer upto 8 MB connections for ONU lines. Copper line users can pay Rs. 600 to upgrade their cable and get higher speeds. So apparently, you are likely to experience upgraded speeds but you need to have ONU lines (in Islamabad, Karachi and Lahore). I think Linkdotnet is also upgrading speeds, my LDN net is showing 2MB since last two weeks but speed is of 1MB. its not like LDN has a choice..
if ptcl doubles their offered speed.. LDN has to inevitably follow in their footsteps. I personally prefer LDN though..
reliable service + response time when calling their call center is a lot better compared to ptcl’s where you have to wait your turn in those never ending long queues. But LDN is not available on ONU. Link dot net is only best for those living near the tel. exchange. Far off and you will start suffering from low SNR and line attenuation. And in that case I guess the only best available option at an affordable rate is getting a fiber optic line + PTCL’s DSL connection. Even if PTCL doubles speed, main phir b PTCL DSL per wapis nahi jaonga jitna customer ko zaleel kertay hain, aur sara din dsl disconnect. You are right. There is customer service is poor. i agree with you kaka. 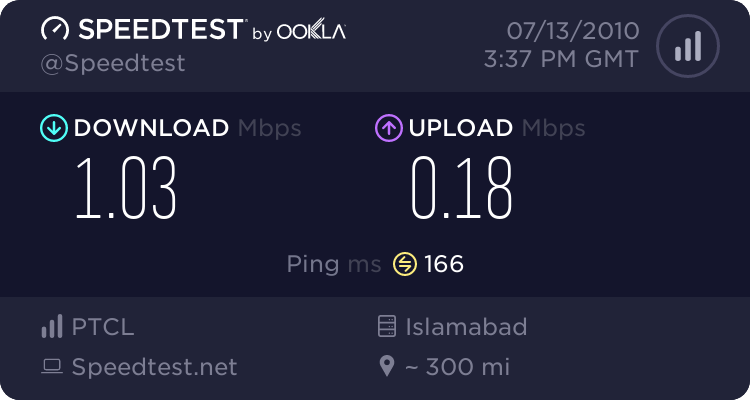 boht zaleel kia ptcl ne, at last tang par k mujhe dsl connection khatam karwana para. i made hundreds of calls to their help line but they didn’t notice. Im using wateen now. Ptcl is a better choice if they improve their customer services and care for their customers. Seems like some Testing is in progress in Karachi and Vicinity, not sure that they will double speeds, due to the faulty copper medium, plus the ONU networks is also very pathetic, battery issues etc etc. i wonder if it will take twice as long for them to fix it when it breaks down ? Local Speed test servers are generating wrong results. Check you speed using ‘New Delhi’ or American servers. I’m still on 1MB (ONU Khi). Waiting for the upgrade. Some users of 1MB and 2MB have been upgraded on Wiredpakistan Forum. Also,On Wiredpakistan, some users did get speeds of 8MB. So they will probably double the 4MB package to 8MB. who i know that my speed increased??? any site?? just download something large and see the speeds. Asalam O Alakom, I think they are not doubling the speed, its 3 or 4 times speed up, I am using 2 mbps connection first the speed status was, 2048 kbps / 504 kbps and now its 13822 kbps / 1020 kbps. That is just your downstream and upstream rate of your modem (line profile). Your actual speed is the download speed that you get when you download something or better yet, check in speedtest.net You will get 4MB speed (if you have been upgraded from 2 MB to 4MB, which seems likely). I am using ptcl from two and a half years and hasn’t found any problem with it. It works well with me–however some other friends of mine complain about their poor services. Yet though, I am getting only 1 MBPS; I don’t know if it is going to be upgrate soon. I was on a 4mbit connection, but was thrown onto 1mbit due to loss of student discount. A week later, i was upgraded.. was getting 1.6 MB downloading speeds for a day. Now im getting 700 KB max. yes but print is not so good we recorded it via mobile camera :( but you can see downloading speed his package was 1MB few days after he is automatically upgraded to 4MB he complained too but ptcl guy said its ok problem is in his pc and again after few days package upgraded to 12MB. According to my sources PTCL is in testing phase for doubling even quadrupling the speeds. My personal experience is that my 4MB has been doubled to 8MB but due to sync issues and lot of complaints from myside it was reverted back. on 8MB I have tested speedtest.net which gives the bursts upto 7mb link, but actual download speed on torrents I got was only peaked to 450 kb/s. I think PTCL should increase the bandwidth pipes from DSLAM to PIE after increasing the subscriber speeds. look at this……i got this result at my 1 mb..
Change their server to US and then try. Server to Islamabad will always give you unbelievable results. I had 512kbps PTCL DSL long time back but whenever I downloaded anything I usually got 200K+ (not kbps) speed, DAP, Internet downloading manager or any accelerator always showed that, webpages opened like this. @Haris, bhai ye sab Israel aur Jews ka propaganda hai. internet se humari qom ko kharab kar rahey hain. But i have still 1MB speed of my DSL Connection, it is not upgraded. i am using ptcl 2mb connection but i checked now. Still having 2mb…. What makes you say that? That won’t make sense. If they upgrade 2 MB to 4 MB and 4 MB To 8MB, and keep the tariff same, then why would they keep 1 MB at 1MB? Doesn’t make sense eh? P.s Im on Copper, not ONU. From Peshawar. Here is the official statement from PTCL. “PTCL has doubled its broadband data rate speed and upgraded all its existing 2Mbps customers to 4Mbps data rate on the same tariff and all existing 4Mbps customers have been upgraded to 6Mbps data service at the same tariff. In addition a new 8Mbps package has also been introduced. PTCL will have the following data rates for all its broadband existing and new customers with effect from July 15th 2010. On What speeds is the STUDENT PACKAGE Available??? ONU means Optical Network Unit – A form of access node that converts optical signals transmitted via fiber to electrical signals that can be transmitted via coaxial cable or twisted pair copper wiring to individual subscribers. ONU (Fiber Optic) and Copper. Some people have ONU while some have copper. And Student Package is only available on 1MB. -On What speeds is the STUDENT PACKAGE Available??? It’s unfair 1MB package is not upgraged because PTCL know that students use complete bandwidth and previously they transferred students from 2/4 MB to 1MB. Yeah I know it’s unfair to let 1MB stay at 1MB. When the upgraded every other package, why didn’t they upgrade this package too? PTCL disabled Student package in 2mb, i then transfered my self to 1mb student package. -Will ONU improve my Pings/Latency in Games?? -Any one has Online Gaming Experience with ONU here? -With ONU we have to Pay Any Monthly Charges?? Register an account, make a new thread, and ask this question there. Good News for all Pakistani…….. I strogly request all Pakistanis to file a complaint that why 1MB package is not upgraded plus any other complaints they may have about PTCL services. Hey ALI can you tell me how you got Battle field bad compny2 working online ?????????????? Bought it on Steam for $50 via Debit Card. is there any student package in 4mb,6md and 8md of ptcl broadband dsl ? Student Package is only available on 1MB.